Road to Worlds Drum-A-Thon, on behalf of the Knoxville Halls HS Band Program, the Halls Band Boosters announces a local event designed to grow community awareness and much needed funding for the Halls HS Indoor Percussion Ensemble and Winterguard programs. What first started as a practice day has now grown into a marathon day of playing as a way for student musicians to raise much needed funding in order to compete at this year’s WGI World Competition to be held in Dayton, OH in April. Those connected with Halls HS Bands know that the Indoor Percussion Ensemble won WGI and ETPAA regionals and was ranked 3rd nationally last year. Earning these titles was no easy task due to the incredible talent and skills of those who participate in these competitions. In addition, 4 members of the ensemble earned individuals positions in this year’s All-East Regional Band, which is a very prestigious honor. Both the MS and HS Winterguard programs are equally impressive, and they are well on their way to winning regionals this year. To earn pledges, these students are willing to play until their fingers bleed, their muscles ache and the limbs are sufficiently bruised all for the chance to compete at Worlds. They will also be putting on two public performances to allow local community members to come out and see these dedicated and talented young musicians run through their 2019 shows. If someone is interested in pledging support for the drum-a-thon, they can visit www.hallsband.org/drum-a-thon/. Whether it's $10 or $100, every dollar makes a difference in the lives of these incredibly talented musicians. 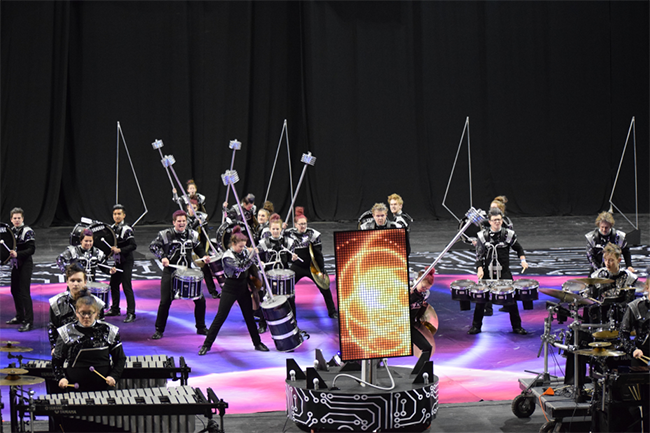 A matinee show will offer attendees a behind-the-scenes view of a typical drumline practice and will finish with a full run-through of their 2019 show. Doors will open at 11:00 AM. Donations will be accepted at the door. There will be a concession stand for those who might want to grab a snack while they watch the performance. The second performance will be a Dinner and Show. Doors will open at 5:00 PM. Beginning at 5:30 PM, a fun and festive Taco/Nacho Bar will include a dessert and drink. Following dinner will be a full-dress performance at 7:00 PM featuring our Indoor Drumline and both our Middle School and High School Winterguard. Advanced tickets to the evening Dinner and Show are $8/adult, $5/student and children 5 and under are FREE. Tickets can be purchased online. Tickets purchased at the door will cost $2 more than advanced tickets. The Halls HS Bands are under the direction of Mr. Eric Baumgardner who is assisted by Ms. Ashley Waller. The MS program is under the direction of Ms. Tiffany Kimbro. HS programs also receive support from dedicated instructors and staff who are highly accomplished in their respective area of performing arts. For the 2018-19 Drumline and Winterguard they are: Chasity Gilliam, Brandi Wilson, Cody Sipe, Dusty DelMoro, Daniel DelMoro, Collin Christie, Britney Hiter, Michelle Edwards, Andrew Neighbor, Alan Summers, Matt Holt, Matt Weyer, Ashley Wagner, and Andrew Chunn. For further information, please visit hallsband.org.